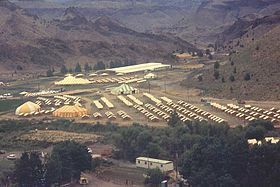 Rajneeshpuram was a community based in Wasco County, Oregon that was where the Rajneeshees, or followers of Bhagwan Rajneesh, were based. I wanted to talk about this community because it is similar to Heaven’s Gate because both groups are based around a single leader and the devotees tend to give up their lives or livelihood for their new religion or movement. Before moving to Oregon to start his community, Rajneesh began his controversial movement that shunned traditional values in favor of free love and meditation while he was a professor of philosophy in India. Soon he began gaining wealthy followers and started camps and lectures based on his values. He also began the Neo-Sannyas International Movement which allowed women to join, which was rare because of it's basis in Hindu, and began his world tour where he hoped to help people find spritual enlightenment. The decline of his power and wealth began when his followers poisoned 751 people in Wasco County, Oregon while trying to rig a political election in favor of Rajneeshees. This event led several leaders of the movement to be criminally charged and deported. There is a really interesting Netflix documentary called Wild Wild Country that talks about the rise and fall of his group and even has stories from people who lived at his community in Oregon and left their jobs and lives to follow his teachings. I thought this related to our class because his meditation claimed to awaken people from their daily lives and he even had a session that involved laughing for three hours straight. These practices and their claims fall under pseudoscience because they aren't based on scientific study, but he did use some psychotherapy and other psychology fundamentals in his teachings. I find these groups or I guess cults extremely fascinating yet terrifying. The ability to be able to use psychotherapy and other methods to convince large groups of people, even just one person, of absurd beliefs is scary. These people killed 751 people and so many other cults have been responsible for deaths and horrible crimes. I'm definitely going to check out that documentary! Great post! It is amazing to me that this cult managed to poison 751 people and I have never even heard of them. I have always been interested in learning about different cults because I just find them to be so creepy. I think they are especially captivating to research because I can not even imagine how one gets to the point of thinking in a way that would end with wanting to harm others or even themselves. Also- thank you for the tip on the Netflix documentary. I know what I will be doing tonight!